The current business context, characterized by macro-economic incentives for carbon-mitigation, stringent environmental compliance constraints and the need to embrace sustainability as a key element of corporate social responsibility, presents difficult challenges for most organizations. These organizations need to re-align their strategies (and eventually their organizational structures and operations) to a new set of sustainability objectives, but lack the tools to enable this. In this chapter, the authors review some of our recent work on documenting strategies as a means to assessing and achieving strategic alignment. 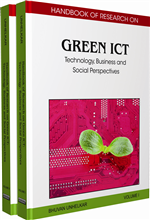 The authors show that these approaches provide an adequate and appropriate basis for documenting both business strategies and “green”/sustainability strategies, and lead to rich vocabulary for analysing strategic alignment. They then address the question of what organizations might do when faced with misalignment between their existing strategies and sustainability imperatives. Depending on the nature of the organizational posture towards sustainability, they outline the kind of analysis organizations might use to decide how to identify compromises between the competing pulls of their existing strategies and green objectives. The emergence of significant macro-economic levers (such as carbon taxes, emissions trading schemes etc.) to incentivize carbon-mitigating behaviours. The introduction of stringent environmental and carbon mitigation-related compliance constraints, both within legislative and regulatory frameworks. A growing need, driven by corporate social responsibility imperatives, to integrate environmental sustainability within the “organizational DNA”. At the highest level, this calls for strategic re-alignment. Existing organizational strategies need to be aligned with these new strategic imperatives. Alignment at the strategic level is a critical pre-cursor to operational shifts to achieve carbon mitigation – it ensures that the organizational transformation required is comprehensive, and not limited to the aspects of the enterprise that are most obviously impacted. Alignment with green strategies ensures an enterprise-wide commitment to the sustainability objectives that these green strategies encode. Strategy and competitive advantage have been widely discussed in both the management and economics literature. The discourse on strategy can be traced back to ancient India, Greece and China as early as 500 BC. More recently, scholars such as Drucker (1954), Chandler (1962), Andrews (1965, 1971), Ansoff (1965), Hofer and Schendel (1978), Mintzberg (1987), Rumelt (1991), Hamel and Prahalad (1989), Ohmae (1989), Porter (1985; 1996) among others, have made important contributions to our understanding of strategy and strategic decision-making. The notion of strategic alignment has assumed considerable importance in the discourse on business strategy. There is widespread acknowledgement of the importance of strategic alignment (Baets, 1996; Henderson and Venkatraman, 1993; MacDonald, 1991; Parker, et al, 1988; Powell, 1993). Discussions of alignment usually involve binary comparisons between corporate strategy on the one hand and an internal functional strategy, such as procurement strategy (Knudsen, 2003), human resource management strategy (Shih and Chiang, 2005), advertising strategy (Boudreau and Watson, 2006) or IT strategy (Baets, 1996; Henderson and Venkatraman, 1993; MacDonald, 1991; Parker et al, 1988; Powell, 1993; Sledgianowski and Luftman, 2005) on the other.